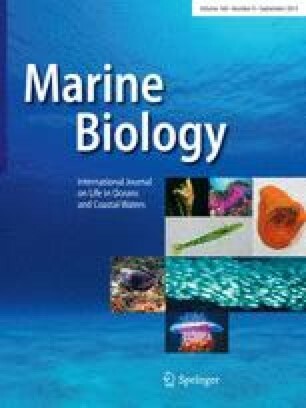 Variations in organ indices, organic levels, organic and caloric contents of the gonads of the brooding echinoid Abatus cordatus (Verrill), collected in the Morbihan Gulf (49°30′S; 70°E) were studied over a 1 yr period (March 1978 to January 1979). In both sexes, a clear annual cycle was discernable for organ indices, and for organic and caloric contents. In contrast, the protein levels in the gonads varied moderately, while the levels of lipid and carbohydrate remained almost constant. This peculiarity sets A. cordatus apart from nearly all other echinoids characterized by an annual reproductive cycle. The male and female gonad indices change synchronously. The gonad indices double during maturation, reflecting variations in the germinal tissue. In both sexes, the maximal gonad index (at the end of March) coincides with the onset of the spawning season. The average male gonad index is 50% higher than that of the female. This difference is related to the restriction of coelomic space in the female due to development of the brood pouches. At maturity, the lipid and carbohydrate levels in the ovary are 2.8 and 2.1 times greater, respectively, than the levels in the testis, the latter having a 25% higher protein level. This disparity in organic levels reflects mainly the differences in germinal tissue composition. The female reproductive effort is higher than that of the male. The spawn energy output of a standard individual is 200 cal for a male and 228 cal for a female. The unusually lower gonad index of the female is compensated for by higher lipid and carbohydrate levels, giving the ovary a 40% higher calorific value.